Easy and Instant deployments and instant scale for .NET? Awhile back a few of us were looking at Ruby Gems as the answer to package management for .NET. The gems platform supported the concept of DLLs as packages although some changes would have needed to happen to have long term use for the entire community. From that we formed a partnership with some folks at Microsoft to make v2 into something that would meet wider adoption across the community, which people now call NuGet. So now we have the concept of package management. What comes next? Instant deployments and instant scaling. Stupid simple API. This is Heroku. It doesn’t sound like much, but when you think of how fast you can go from an idea to having someone else tinker with it, you can start to see its power. In literally seconds you can be looking at your rails application deployed and online. Then when you are ready to scale, you can do that. This is power. Some may call this “cloud-computing” or PaaS (Platform as a Service). I first ran into Heroku back in July when I met Nick of RubyGems.org. At the time there was no alternative in the .NET-o-sphere. I don’t count Windows Azure, mostly because it is not simple and I don’t believe there is a free version. Heroku itself would not lend itself well to .NET due to the nature of platforms and each language’s specific needs (solution stack). So I tucked the idea in the back of my head and moved on. 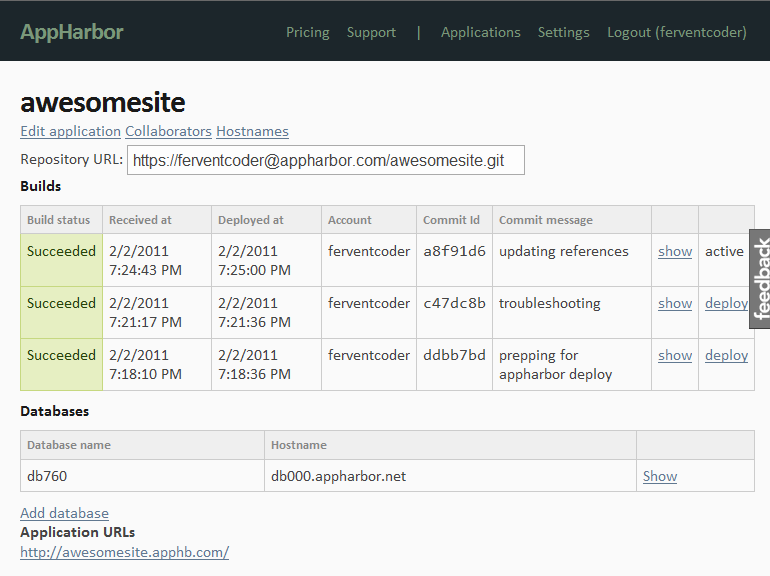 I’m not sure when I first heard about AppHarbor as a possible .NET version of Heroku. It may have been in November, but I didn’t actually try it until January. I was instantly hooked. 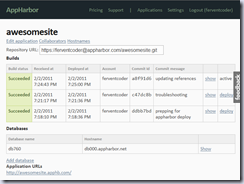 AppHarbor is awesome! It still has a ways to go to be considered Heroku for .NET, but it already has a growing community. I created a video series (at the bottom of this post) that really highlights how fast you can get a product onto the web and really shows the power and simplicity of AppHarbor. Deploying is as simple as a git/hg push to appharbor. From there they build your code, run any unit tests you have and deploy it if everything succeeds. The screen on the right shows a simple and elegant UI to getting things done. After playing with it, send feedback if you want more features. Go vote up two features I want that will make it more like Heroku. Disclaimer: I am in no way affiliated with AppHarbor and have not received any funds or favors from anyone at AppHarbor. I just think it is awesome and I want others to know about it. Now I have a challenge for you. I created a video series showing how fast I could go from nothing to a deployed application. It could have been from Zero to Deployed in Less than 5 minutes, but I wanted to show you the tools a little more and give you an opportunity to beat my time. And that’s the challenge. Beat my time and show it in a video response. The video series is below (at least one of the videos has to be watched on YouTube). The person with the best time by March 15th @ 11:59PM CST will receive a prize. Video(s) must be published by March 15th at 11:59PM CST.